Ian Harper just cannot stop meddling. During his 35-year career as a professional economist, he has worked with governments, banks, corporates and leading professional services firms at the highest level. Whether it be reviewing Australia's competition policy, Victoria's state finances or chairing the Australian Fair Pay Commission, he acts out of a passionate belief that economists can actually be useful.Ian's career in economics has enabled him to participate in some of the most important debates over the future of Australia and influence some of the nation's most talented emerging leaders. 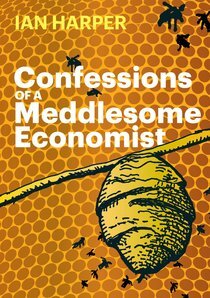 In 'Confessions of a Meddlesome Economist, the long-awaited revised and updated edition of his prize-winning book 'Economics for Life', published in 2011, Ian revisits some old debates and introduces new ones ? including the purpose of place ? all in the context of his professional life. There is no trace of self-indulgence or self-congratulation in this narrative, rather a thoughtful account of choices, successes and disappointments.The aim the same: to illustrate the power of good economics to improve people's material lives and the power of the Christian faith in helping this practising economist keep his professional life in proper perspective. About "Confessions of a Meddlesome Economist"
Ian Harper has worked closely with governments, banks, corporates and leading professional services firms at the highest level. As a member of the celebrated Wallis Inquiry, he was at the forefront of financial market reform in Australia.In August 2008, Ian joined Access Economics, following a 25-year academic career, including 16 years at Melbourne Business School. In recognition of his service to the University of Melbourne, Ian was elected Emeritus Professor on his departure.From December 2005 to July 2009, Ian served as inaugural Chairman of the Australian Fair Pay Commission. In July 2010, he was appointed to the Australian Advisory Board of Bank of America Merrill Lynch along with three others.In 2000, Ian was elected to a Fellowship of the Academy of Social Sciences in Australia in recognition of his standing as an academic economist and more recently to a Fellowship of the Australian Institute of Company Directors.